What’s the best miter saw for the money? Well, that’s the question we’re here to answer, but I must warn you now — this article is a comprehensive miter saw buying guide that literally explains everything you need to know about miter saws. The first half of the article will provide a wealth of information and details about miter saws in general and the second half of the article will focus on specific models that we recommend and are proud to say they belong to the prestigious club of : Best Chainsaw for the Money! You must be familiar with chop saws if you’ve ever been to an automobile workshop or repair station. These saws are designed to cut into metal pipes and sheets, and feature a circular saw blade that is tipped with extremely hard teeth in order to slice through even the toughest of steels with ease. Chop saws are specialized circular saws, and circular saws have been around us for quite some time. They are great for sizing up poles and planks, or for cutting pieces of wood and metal to length. But what does all of this have to do with the miter saw? Is it some special type of saw that uses a unique operation principle? You just might fall in love with this saw — if that’s possible. Well, a miter saw is basically a circular saw that is capable of making miter cuts. It does so by rotating upon a circular base that is connected to a miter gauge for precise angular movement. Unless you are familiar with woodworking terms or equipment, all of this stuff might not make much sense. Don’t worry, because we are about to explain what a miter cut is, as well as the various types of cuts that you can make with a miter saw. For now, you just need to know that the miter saw is one of the most valuable tools when it comes to making door frames, crown molds, picture/photo frames, or even fencing. Whether you’re a simple DIY enthusiast looking to build a study table for your kid, or an aspiring woodworker with a little workshop in the basement, a miter saw will definitely be a great addition to your arsenal of woodworking tools. In this article we shall talk about how a miter saw works, how you can choose the perfect miter saw for yourself, and even discuss about some of the best miter saws that are currently available on the market. What a Miter Saw can Do? Let’s start with the obvious — it can make miter cuts. But exactly what is a miter cut? For explaining that, we need to talk about the concept of wood grain. Unless you are a complete beginner in woodworking or carpentry, you must know that wood grain is an incredibly versatile term and can refer to various things at the same time. Normally though, the grain of a certain sample of wood refers to the pattern formed by the alignment of wooden fibers within that sample. Wood is made up of cells, just like any other living organism. If you talk from a technical standpoint, grain refers to the orientation of wood cell fibers. Some woods have straight grain, while the others have diagonal or spiral grain. Spiral grain means that the wood fibers are oriented around the longitudinal axis of the tree. This means that when you cut open a cross section of the trunk, you will find a spiraling pattern which is darkest and densest at the central axis of the tree. In reality, there are literally hundreds of grain types, some of which are extremely complex and can vary from one type of wood to the other. However for the sake of simplicity, we shall keep this explanation short and limit ourselves to three above mentioned types of grain (straight, diagonal, and spiral). Straight grain is parallel to the axis of the tree, and is extremely easy to work with. This is also the most commonly found type, and you will see planks and boards made from straight grain wood in almost all furniture, ranging from chairs and tables, to doors and window panes. But let’s get back to the point we were originally discussing — what relation does wood grain have with the types of cuts that you can make? Well, think of wood grain as a river of water that is flowing in one fixed direction. It is easiest to cut the wood along the grain (with the flow), harder to cut across the grain (perpendicular to the flow), and hardest to cut against the grain (against the flow). A crosscut happens when you cut perpendicular to the grain, i.e. across the grain. Here are the four types of cuts that you can make with a miter saw (the last two types are very hard to do with a basic miter saw). Cut boards up to 3.5 inches thick and 11.75 inches long. WEN 70712 : Roomy work table gives you 120 square inches of depth while the workpiece support arms extend out for 32 total inches of material support. Designed with an automatic blade cover that retracts when it’s not operating for maximum safety. A crosscut is actually a type of miter cut. When you execute a miter cut at an angle of 90° on a stock of wood (plank, board, pole, etc. ), it is called a crosscut. The name pretty much explains it all- you are cutting across the wooden board, at right angles to the grain. Or, you can say that you’re cutting along the width of the board. Normally a crosscut is done whenever you need to cut something down to the proper length. For example, you need to execute a crosscut while sizing up the length of a wooden fence piece. You also need to do a crosscut if a particular wooden board or plank just came out from the saw mill, and its edges are not perfectly trim or “clean” (because the mill ripped through the edges instead of slicing through them). In that case, you can use the crosscut to re-edge a piece of wood. Can cut miters on 45-degree, 90-degree and 22.5-degree angles. This is the cut that every basic miter saw is capable of doing, and this is what gives a miter saw its name. Technically speaking, a miter cut is an angled cut. Here, we shall assume that a perfectly straight line across drawn perpendicular to the length of a wooden plank or board represents the zero degree mark. This line is going to be perpendicular to the grain of the board (Assuming straight grain across the length of the board). If you cut to the right of this line, it will be a positive angle miter cut. To the left, you have the negative angle. Picture a protractor on the perfectly flat surface of the wooden board, and a miter cut can be made at any angle on this protractor. In a miter saw, this is done by rotating the vertical axis of the rotating saw upon a fixed base. Miter cuts are used extensively for creating basic photo or portrait frames (45° miter cuts for joints in a square/rectangular frame), as well as door frames and window panels. A bevel cut is something that is not possible with a basic miter saw. In a bevel cut, you need to rotate the saw blade along its horizontal axis. Bevel angle refers to the tilt of the saw blade from the vertical on the saw table. In a basic miter saw, the saw blade is always aligned perpendicular to the sawing table or ground. In a compound miter saw, you can pivot the blade assembly in order to make bevel cuts. In short, the bevel axis is always perpendicular to the miter axis. Miter axis is along the length of the sawing table, and a miter cut is made along this plane only. The bevel axis is perpendicular to the miter axis, and you also have both positive as well as negative bevel angles. So, you’re cutting along the thickness of the board with a bevel cut. Bevel cuts are useful for crown molding, as well as for creating bevel joints in photo frames and wooden shelves. You know what a miter cut is. You also know what a bevel cut is. Now, what if we were to execute both of these in a single cut? That would be a “compound” cut. Note that if you set both bevel and miter angle to “zero”, then you essentially end up with a crosscut. With a compound cut, you’re cutting at angles to both width and thickness at the same time. This is something which is extensively used in crown molding, or for creating certain types of door frames and cabinet attachments. Again, this type of cut is very hard to perform with a basic miter saw (only professional woodworkers can do compound cuts with a basic miter saw, and even they need a lot of time for that). Now that you know all about the types of cuts that you can make with a miter saw, you must have gotten an idea of how all of this can help you with your needs. If you happen to be a first-time woodworker and are attending woodworking workshops or classes, then owning even a basic miter saw at your home will allow you to create some incredibly amazing projects. You can make photo frames, design door panels, and work on cabinets. If you’re into home improvement and need a reliable, simple to operate, highly productive wood shaping tool, then consider investing in a miter saw. You don’t need to get a top of the line miter saw with dual-bevel capability, and a sliding 12” saw head. Just get a basic 8” miter saw to size up the fences for your garden, or do the legs for that study table which you plan on gifting to your child. There are several uses for a miter saw, and we shall not go through all of those over here in this article. We are instead focused on providing you with a thorough insight into how a miter saw functions, what are the types of miter saws out there, and which one should you buy based on your needs. In the next section we shall discuss how a miter saw works, and talk about the most significant parts of a miters saw. Once you know what each part does, and how it affects the performance of the saw as a whole, you will get a pretty clear idea regarding the features and specs that you would need in the perfect miter saw for yourself. Even though all the various terminology and technical jargon makes it seem like some sort of ultra-complex wood cutting machine, the miter saw is actually a very easy to use machine that is built around a few key parts such as the motor, frame, and blade. All miter saws, irrespective of the manufacturer or price, are going to have a lot of parts in common. We shall discuss about those parts below, so reading the following section will give you a pretty clear idea of how a miter saw does its job. This is the heart of a miter saw, and is responsible for powering the circular blade. Each time you press the trigger on the trigger handle, it closes an electronic circuit and current runs through the motor, causing it to spin. This spinning motion drives the circular blade, which then slices into the wood. The motor of a miter saw is often positioned right next to the saw head, and most miter saws utilize a direct drive system. What this means is, the motor shaft is connected directly with the circular saw blade. Well actually, the spindle from the motor is connected to the central hub that is then connected with the saw blade. Then you have certain drive mechanisms that use a belt and pulley assembly to connect the motor with the saw blade. In saws that use this system, the motor is positioned a little towards the rear to allow for greater visibility while making cuts. Designed for safety on: Table Saws, Router Tables, Jointers, & Band Saws. The electric motors that power miter saws are often rated in terms of the number of amps that they need to run. If a motor is rated at 15A, it means that motor has more windings in its stator as well as rotor. More windings result in a stronger magnetic field, which translates into higher rotation speed. If you’re not familiar with the inner workings and principles of electromagnetic induction based motors, there is no need to worry. Just know that saws with larger blades will usually come with a motor that is rated at 12 amps, or higher. Higher amp rating means that the motor can handle larger, heavier saw blades (10”, 12”, 14”, etc.). In some modern saws, there is often an electric brake system which when activated, runs current through the motor in reverse direction. When this happens the motor tries to spin in the opposite direction, resulting in a braking effect that brings the spinning circular blade to a complete stop in less than 2 seconds. Saws without this feature need much longer to come to a stop, especially the ones with larger and heavier blades. Laser casts a line over the whole cutting width for improved accuracy. What is a saw without its blade? No matter how advanced the motor, how sturdy the frame, or how accurate the miter/bevel scale, you cannot make good cuts without a good blade. Circular saw blades are used in miter saws, and these come in various sizes and feature different tooth densities as well as tooth types. Just like you need different tools for each specific job, you need to get different miter saw blades depending on what you want to cut, and how thick it that material is. The two most important parameters are of course blade diameter as well as type. Handheld circular saws feature blades ranging between 4.5” to 7.25” in diameter. Most cordless miter saws use 7.25” blades, and this is the most popular blade type for a typical circular saw. So if you’ve got a standard chop saw lying around in the workshop and your miter saw’s blade just broke down, you can easily swap out the 7.25” blade with the one from your chop saw. The typical miter saw has a blade diameter of anywhere between 8” and 14”. The two most common blade sizes for miter saws are 10” and 12”, since you can pretty much do all types of regular DIY work, home improvement projects, and even light construction work with these two blade sizes. Saws that are intended to cut metal sheets and pipes use 10/12 inch carbide tipped blades, while metal-cutting chop saws (14” and above) use abrasive blades that are coated with either aluminum oxide or silicon carbide. Certain tile saws may use 7 or 10 inch diamond blades. Note the arbor hole size on the blade that you’re buying for your miter saw, and make sure that it is compatible (circular or diamond shaped arbor) with your saw. Also, check the maximum rpm rating that the saw blade carries for use with different materials (wood, ferrous metals, non-ferrous metals, etc.). This may seem like a super simple and not-so-important feature, but running a miter saw with a dysfunctional blade guard is the same as driving a car on the freeway at 100 mph without brakes. Unless you want the saw to take your hand in the event of a kickback, you better check that blade guard and make sure it is functional before switching on the saw. Modern miter saws use a self-retracting blade guard that automatically slides out of the way as you lower your saw into the wood. As you lift the saw back up, the blade guard will slide back into its regular “closed” position. The blade guard can be made of metal or transparent plastic, and it is usually a semi-circular cover like structure which is pivoted to the central hub upon which the saw blade is mounted. Miter cuts are impossible to make without a miter scale, since you cannot know which angle you are cutting at unless you set the saw to that angle by referring to the miter scale. Think of it as a protractor which guides your saw blade into the correct position for making the miter cut. There is a scale plate mounted onto the frame of your saw, and this plate is marked with measurements for angles in degrees. There may be angles on either side of the middle perpendicular line, or the “zero” line. If the miter scale has angles on both sides and the table can rotate either way, then it means you can execute opposing miter cuts at equal angles (say for example, cuts at 31.5° and -31.5°), without having to lift and reposition your work piece on the table in the reverse direction. This is the handle that allows you to turn the entire saw assembly as well as the underlying circular work table. It has a locking mechanism which will let you lock the saw into position once you hit the desired angle. Some come with thumb-activated release and latch mechanism so that you can quickly and conveniently adjust angles with a press of the thumb. Most modern miter saws will also come with “Positive Stops”. These are basically factory-defined set points that represent the most commonly used miter cut angles on the scale (ex: 45° for basic photo frames). Whenever you pass the miter lock handle over one of these stop points, you will feel a tactile bump and can hear a click sound. If you let go at that exact moment, the saw will lock into the angle specified by the respective positive stop point. Just like the miter scale allows you to make miter cuts, the bevel scale allows you to make bevel cuts. If your saw has only positive values of angles on the bevel scale it means that you have a single-bevel compound miter saw. You will need to remove the work piece from the table and reposition it in the opposite direction if you want to make opposing bevel cuts. The bevel scale is positioned right next to the pivot point of your saw head, and its plane is perpendicular to that of your table. Remember, this scale as well as the bevel adjustment handle, can only be found on compound miter saws. The miter fence is usually made of polished aluminum and most good miter saws come with a fence that supports two different height settings. This is a wall like structure that lies on the edge of the throat depth of your working table, and it is oriented perpendicular to the working table, IE. it stretches along the y-axis. A miter fence is pretty useful for making miter cuts, as it allows you to slide the wooden work piece back and forth along its length, while maintaining a constant angle. Ever rested a set square or protractor against the ruler while sliding it across the page to draw a line at a different location, but while maintaining the same angle? This is kind of like that. Miter fenced with adjustable heights allow you to rest thicker or thinner planks/boards of wood on the cutting table. With a taller fence, you can even execute crosscuts or bevel cuts along the width of a board/plank, by resting it sideways so that the face of the board/plank rests against the fence. Adjustable stainless steel miter detent plate with 13 positive stops. The work clamp is used to prevent your work from sliding around on the table once you have marked the perfect cutting point on the wood. This may be a spring-loaded clamp, or a pneumatic clamp. Normally, the work clamp is located right on top of the work table so that you can conveniently adjust its pressure and height depending on the thickness of the piece that you’re cutting. The table on a miter saw consists of two different parts- the circular rotating part that can spin independently of the rest of the frame, and the fixed rectangular part that is a part of the base and frame itself. The fixed part of the table may also carry table extension tubes or arms on the side which can be retracted whenever the work piece does not demand additional support (depending on its length of course. Normally, the table is made from cast iron or stainless steel with a completely flat top surface that is designed to provide an even resting platform for the wood. This is the handle that is connected with the saw + motor head unit. There is a trigger on the inside of this handle, and pressing it will activate the saw blade and cause it to spin. Of course, you have to deactivate the safety before you can trigger the saw blade. This is quite similar to running any other powered tool that has a trigger on the handle (power drill, powered hand saw, jackhammer, etc.). Right next to the saw blade, there will be a dust collection port that inhales most of the saw dust that is released as the teeth grind against the wood. All good miter saws will have a dust collection bag attached to the side of the saw head, and this bag is fed by a pipe that runs from the dust collection port. Some larger and costlier miter saws even include a large dust exhaust port attachment on the back that can be hooked up with industrial vacuums. This ensures that every single bit of saw dust is sucked away from the table top, and nothing is going to clog or jam your saw blades while cutting through wood. Of course, saw dust and wooden splinters become a significant issue only if you cut huge amounts of wood every day. In that case, you actually might need to get one of those expensive dual-bevel compound miter saws with the industrial vacuum dust exhaust port on the back. Otherwise, the simple dust collection bag will suffice. As is the case with almost every other power tool out there, there are several types of miter saws out there. Different people have different needs, so one miter saw blade size and design might not suffice for everyone. Some prefer to have a smaller and less powerful, but cordless miter saw that they can carry with them to the jobsite for cutting pipes and tubing. Some might need a sliding miter saw because they plan on cutting wider boards and planks for making tables, doors, etc. Some people would want a dual-bevel compound miter saw because they do a lot of crown molding and framing. Read on below to know which miter saw would be right for you. A basic miter saw is the cheapest of all types, and most DIY enthusiasts or homeowners will probably want to pick up one of these. Think about it, if all you plan on doing with the miter saw is cutting some legs for a new table, or sizing up that fencing for your garden, then you don’t need the ability to make bevel cuts. If you’re primarily interested in cutting across the width of the board, then a basic miter saw will meet all of your needs. It is capable of doing two types of cuts — the crosscut, and the miter cut. Because basic miter saws have fewer moving parts and are less complex in their construction, they are lighter and more stable while cutting when compared to say, a sliding dual-bevel compound miter saw. This means that you will actually get cleaner crosscuts and slightly more accurate miter cuts with a basic saw than you will get with a more expensive compound miter saw that has lots of moving parts and a multi-section arm to hold the saw head. But then, you are heavily limited by the type of cut that you can make with one of these. Want to do lots of framing or crown molding? Sorry, but this saw cannot do that for you. Another thing to note — most basic miter saws are designed to be cheap and easily accessible to the average middle class consumer who is new to woodworking and has just begun attending woodworking classes. A bevel miter saw is also known as a compound miter saw. This is because you can make compound cuts with one of these saws. They differ from a regular miter saw in the sense that there is a pivoting saw-motor head unit mounted onto the frame that allows you to rotate the saw along its horizontal axis. When we don’t explicitly mention “dual-bevel”, we are referring to a single-bevel miter saw. In these units, the saw head can only bevel in one direction, i.e. you can only set positive values of angle on the bevel scale. If you wish to make opposing bevel cuts, you will need to unclamp the work piece and set it back on the work table in reverse orientation. That means, you need to be extra careful with your markings on the wood, since shifting the whole piece around could mean that you will encounter some inaccuracy while doing the reverse bevel cut. That, and the extra time that you spend for orienting the wooden piece means that a single-bevel miter saw is best only in situations where you don’t need to execute a whole lot of bevel cuts. If you happen to own a workshop, or plan on doing framing and crown molding on a larger scale, then it would be much wiser to invest in a dual-bevel miter saw since it will save you so much time and effort. In a dual-bevel miter saw the saw head can swivel both ways, i.e. both left as well as right. So you can execute miter cuts using both positive as well as negative angles on a dual-bevel miter saw. This means that you can easily do crown molding, framing, bevel joints, etc. with a dual-bevel miter saw, and you won’t need to remove the work piece and reposition it in the opposite direction every time you need to make opposing bevel cuts. This saves time and reduces the chances of misplacing the cut since the actual wooden piece doesn’t need to be moved. The single-bevel miter saw can do everything that a dual-bevel miter saw can, except the dual-bevel miter saw is twice as fast with certain types of bevel cuts (ones that utilize both positive as well as negative angles). If you plan on doing a whole lot of framing or crown molding, definitely invest in one of these. A sliding dual bevel miter saw is equipped with a type of sliding tube mechanism that allows the saw and motor assembly to slide back and forth so that you can work on wider boards/planks. An example of a situation in which you might need one of these, is when you are cutting a 2 x 8 inch wooden plank using an 8” miter saw. A 2 x 8 inch plank/board is 2 inches thick and 8 inches wide. With an 8 inch saw blade, you cannot cut through more 6” of width because of the limited saw blade diameter and cutting depth. However, if the saw blade could slide across the width of the board, this would allow you to execute crosscuts and miter cuts on much wider samples. A sliding dual-bevel miter saw is essential in situations where you need to cut across surfaces that have widths which are equal to, or larger than the diameter of the circular saw blade. Does the fencing around your house use wide fence pieces (8” and wider)? Maybe you want to create a tabletop, or the panels for a new door? In situations like these, the extra cutting reach of a sliding compound miter saw can come in handy. We just mentioned the 4 main types of miter saws, and gave you a brief overview of what each one is capable of. However, you cannot make a purchase decision based on that information alone. You also need to know about the different types of blades, blade sizes, as well as the advantages of corded/cordless models. In general, a saw blade with more teeth will yield finer cuts than a blade with fewer teeth. Blades with fewer teeth are better at clearing material faster, so they will cut more rapidly at the cost of delivering a coarser finish. For example, a 10” blade that has been designed for wood ripping may have as few as 24 teeth, and its main goal is to remove wooden fibers as fast as possible along the grain. A ripping blade will go through hardwood with ease, and will deliver a fast yet relatively coarse finish when you go along with the natural grain of the wooden board. If you take a crosscut blade though, it will feature more teeth and will slice at right angles to the grain while still delivering a pretty amazing finish. Crosscut blades can have as many as 80 teeth, and this means that you will cut slower but get a much better finish even while cutting across the grain. Think about it, if you have two saw blades of the exact same diameter but blade “A” has twice as many teeth as blade “B”, then each tooth on A removes nearly half as much material per stroke in comparison to a tooth on blade B. Removing less material means that you cut slower, but also cover a tighter space. This results in a cleaner finish, which is why you wish to go for a higher tooth count while doing crosscuts or specialized miter cuts. More cuts per rotation also means a slower feed rate, so you will notice that crosscut saw blades are rated at a lower rpm than ripping saw blades. The gullet is the space between two consecutive teeth, and is meant to assist with chip removal. In blades that have a faster feed rate, i.e. saw blades which cut faster, you will notice a deeper gullet. This is because each tooth removes more material (chipping) per stroke, so a deeper gullet is needed to scrape all of that chipping away from the path of the teeth. In a crosscutting or fine woodworking saw blades, the gullet will be shallower. Some radial arm and sliding miter saws tend to vibrate or shake heavily when you induce a faster feed rate, so their blades have specially sized gullets that are deliberately shrunk down in size to inhibit faster feed rates. The shape of the teeth as well as their alignment can affect the speed at which the saw blade cuts, and the cleanliness of its cut. To know whether a saw blade is good for crosscutting, laminate cutting, or ripping, you need to take a look at the type of teeth that it uses. Flat top teeth (FT): These are used on blades designed for ripping both hard as well as soft woods. Alternate top bevel (ATB): In this configuration, the teeth alternate between left and right-angled bevels. This type is best for cutting natural woods and veneered plywood, because it delivers a cleaner and extra polished cut. Combination tooth (Comb. ): In this configuration, teeth are arranged in groups of five – with 4 ATB teeth leading the way, and one FT tooth behind these 4. There are large gullets between each group of 5 teeth. Triple Chip Grind (TCG): TCG teeth are the best for slicing through laminates, MDF, and plastics. Teeth are arranged alternatively, with a flat “raking” tooth, followed by a higher “trapeze” tooth. If you plan on cutting through a lot of plastic pipes/tubing, or MDF sheets and boards, you might want to buy a TCG blade. TCG blades are also good for cutting through softer, non-ferrous metals (tin, copper, aluminum, etc.). High Alternate Top Bevel (Hi-ATB): If you plan on cutting extremely delicate stuff such as melamine (which is prone to chipping), you might want to buy a saw blade that uses the Hi-ATB tooth pattern. These are excellent for delivering extra-fine cuts, because of their knife like cutting action. On almost every single saw blade, the teeth are angled slightly forwards or backwards, rather than being perfectly in line with the center of the blade. This deviance from the radial line is called “hook angle”. On a blade that features a positive hook angle, the teeth are angled slightly forward, in the direction that the blade rotates. If the blade features a negative hook angle, the teeth are tilted backwards, and away from the direction in which the blade rotates. If you want to cut aggressively, with lots of speed, then go for a positive hook angle. You will be ripping through the wood fibers in no time with a highly positive hook angle. But this will also require a more powerful motor with lots of torque to drive the teeth into and through the wood. If you are okay with stepping down on the throttle, but need an absolutely clean, mirror-like finish, then you better get a blade that features a highly negative hook angle. A negative hook angle prevents the blade from “climbing” the material that is being cut, and it also restricts you from applying a fast feed rate. If you have a sliding miter saw or radial-arm saw, you might want to go with a low hook angle blade. If you want to rip wood, the go for a positive hook angle. Kerf-width refers to the width of the slot that the blade cuts in the material. A full kerf is about 1/8” thick, and a thin kerf is about 3/32”. Removing more material with each sweep requires extra power, so you need a minimum or 3hp if you’re going for a full-kerf blade. Before you buy a thicker blade for your miter saw, you better check with the manufacturer of your saw to make sure that the motor has sufficient power for spinning the blade at its designated rpm levels. Also, more heat is generated with thicker blades since more saw blade is in contact with wood at any given point in time. This translates into more friction, and hence thick or high kerf blades have larger expansion slots built into them. Thin kerf blades require less power to cut through a given material, and also generate less heat/waste material. A saw blade that is too thin might tend to vibrate more at higher speeds, especially while cutting through harder materials. Thin kerf blades are typically intended for use in table mounted saws, as well as small, portable, cordless models. High quality saw blades use teeth which consist of carbide cutting tips, fused straight into the steel blade edge. On some of the finest blades, the carbide is formulated specially for the application of the blade, and a tri-metal brazing process is used to attach the carbide cutters to the steel plate. In this process, a layer of copper alloy is sandwiched between multiple layers of silver alloy to provide extra flexibility and impact resistance. If you want super hard blades that require little to no re-sharpening, even after several months of usage, then a blade that uses “C3” micro-grain carbide teeth would be the minimum requirement. If you just want a great general-purpose blade, then get a saw blade that uses Hi-ATB teeth. These can provide good results with all types of materials and can execute any type of cut. They feature a slightly positive hook angle, with medium sized gullets. If you wish to do crosscutting and ripping with the same blade, then get a combination blade (4 ATB + 1 Flat tooth per group, with large gullets in between). The individual teeth in each group of 5 teeth have small gullets in between them, with large gullets between each group of teeth. Confused as to whether you should select a single-bevel or dual-bevel compound miter saw? Well, think about this- how often do you think you’ll need to execute opposing miter cuts? Do you run a specialized workshop or department, where crown molding and framing is the primary type of workload? Then it would be wise to spend the extra initial cash and go for a good dual-bevel compound miter saw. This will save you a bunch of time, and will also make those opposing bevel cuts much more consistent and less prone to error. However if your primary workload consists of crosscutting and basic framing, with the necessity for occasional bevel cuts, then save the cash and get a single-bevel model instead. Sliding saw heads will allow you to execute wider crosscuts, meaning that you can resize and re-edge wider boards/planks. A sliding saw head is essential if you plan on doing tabletops, bed panels, door panels, extra-wide fencing, etc. Not just crosscuts, you can also execute bevel and miter cuts as well as compound cuts on wider material if you get a saw with a sliding head. Instead of a sliding saw head, some of the costlier models also utilize an arm-mounted sawing head. In these compound miter saws, the entire saw + motor assembly is mounted on a folding arm rack that uses pneumatic stabilizers and spring loading tensioning systems to keep the saw head stable even when it is fully extended. If your job site does not have a power outlet nearby, then carrying a cordless 8” miter saw along with you can prove to be immensely useful. You can slice pipes, metal tubing, sheets, and wooden planks/boards in a matter of minutes without even breaking a sweat. You can do all of this, without even needing to plug your saw into a power outlet. A cordless model will be less powerful than a corded one if the same class, even though the cordless equivalent costs more. For a 15-Amp miter saw use a 10-amp extension to maximize its power. Basically, it is like the difference between a laptop and desktop PC- the laptop will always be less powerful than a desktop PC of equal price, and there are limits to how powerful a laptop can be, no matter how much money you are willing to splurge on one. There are cordless models which can only execute basic miter cuts, and they even have limited angles (up to 50°). Then, you have the cordless models that offer both positive as well as negative miter cuts, along with single or dual-bevel options so that you can carry out compound cuts on them. You can spend a little more, and buy a complete dual-bevel sliding compound miter saw that runs on battery to meet all of your cutting needs. But you will be limited by the saws power, since a motor can only do so much when it is powered by an 18V/24V portable battery. Some of the best saws on the market come with super cool additions such as laser pointers, built-in vacuum suction to pull away more saw dust into the dust bag, and LED lamps to provide better lighting. You will find a lot of these attachments as aftermarket accessories for your miter saw, but it is always nice to have them bundled along with your machine since they will all be covered by a single warranty and this saves you from having to scramble around, contacting each individual company, if one of the aftermarket accessories fails. Besides, not all miter saws will support external attachments such as laser pointers, LED lamps, vacuum suction, and the like. A laser pointer allows you to pinpoint exactly where the cut is going to be made, and this feature can be extremely useful for novice woodworkers or new miter saw operators who are not yet acquainted with the behavior of the machine. If you are going to be ripping through softwoods, or cutting a lot of particle board, then you might want to invest in a miter saw that either allows a vacuum hose to be attached, or has its own built-in sawdust suction mechanism near the saw head. Best Miter Saw for the Money! Now that you know all about the workings of a miter saw, let us take a look at some of the best miter saws currently available on the market. These models are all from extremely reputable manufacturers such as DEWALT, Makita, and Bosch. Each manufacturer excels in certain areas, for example DEWALT miter saws feature some of the best motors while Makita miter saws have the most advanced sliding rail systems as well as rack arm suspensions. Bosch provides solid build quality, excellent warranties and bundles in some really neat extras along with the miter saw such as integrated suction systems for clearing up saw dust, wet suction ability, precision laser guided blades, etc. We have arranged 15 different miter saw overviews in the form of groups, with each group pertaining to a specific manufacturer. In the end, we have provided a few ultra-affordable options for the customer who is on a tight budget, yet needs a miter saw that is cheap yet reliable. NOTE: Please read the entire manual for your specific miter saw before even turning it on. Far too many people think they know everything and don’t take the time to read the manual for their miter saw, or any other power tool. This is a mistake. Every miter saw is unique and it’s essential that you spend the time to learn the facts on operation and safety procedures before using it. 3-year warranty keeps you covered if something goes wrong. with this miter saw, or any other miter saw unless it’s specifically rated to cut materials other than wood. Tall sliding fences support crown molding up to 7-1/2 in. nested and base molding up to 6-3/4 in. vertically against the fence while easily sliding out of the way for bevel cuts. Miters 60 degree to the right and 50 degree to the left providing increased capacity. Cam lock miter handle with detent override delivers quick and accurate miter angles. Equipped with an automatic electric blade brake which stops the saw blade within 5 seconds of trigger release. ✓ View or download the MANUAL for the DEWALT DWS779. This is a 12” sliding compound miter saw from DEWALT, and it features one of the most powerful motors of any saw that we have tested to date. The 15A heavy duty electric motor mounted inside this beast can spin at a maximum speed of 3800 rpm, and powers the 12” saw blade via a direct drive system. A magnificent piece of machinery that gives you full control. There are two things to note here — first of all, the 15A motor is actually a little too powerful for standard cutting operations such as crosscutting boards/planks, or for executing standard miter and bevel cuts on 2” thick pieces of hardwood and particle board. Secondly, the maximum cutting thickness of 6.75” indicates that this motor carries more torque than its counterparts, even those that are rated at 15A. This also means that you can use the DEWALT DWS779 saw for cutting through metal sheets and pipes with the proper blade (it can double up as a great chop saw). Moving on to the other parts of this saw, you will be pleased to know that this is indeed a dual-bevel compound miter saw which means that you don’t have to remove and reposition the wood every time you need to execute an opposing bevel cut. The miter gauge has been designed well, with highly legible degree markings and a nice dark, non-shiny finish which ensures that you will be able to follow the markings even when a lot of light is falling on the scale. The miter table can rotate a maximum of 50° to the left, and a maximum of 60° to the right. Click on image to view full diagram. There are positive stops built-into the miter system so that you can instantly lock the saw into a commonly used angle (such as 32.5°, 45°, etc.). The miter lock handle features a thumb-press release system for added convenience. This saws blade can be changed within a matter of minutes, because it slides off the arbor with a simple nut removal, and the entire blade change process will be error free as the blade is mounted via a keyed hub that only allows you to install the blade in one fixed orientation. Never again will you install the blade with the teeth aligned in the wrong direction, thanks to this keyed installation process. The arbor size is 5/8 inches, so purchase your blades accordingly. The sliding system is based on dual horizontal steel rails that are held together with a sturdy clamping mechanism, and the saw head slides with the help of linear ball bearings. All of this results in increased accuracy and stability while cutting, meaning that you don’t have to worry about botching up the cuts anymore because of vibration on the sliding rail. This is an issue with certain sliding saws, since they use thinner steel rails that are incapable of handling the vibrational energy of a saw head as it hits higher rpm’s, but since DEWALT use the highest quality linear bearings and super thick steel rails that have been clamped into place, you can assume that this sliding saw will be as stable as a saw that features a fixed pivoting head. The aluminum fence features a sliding mechanism so that you can adjust its height. The fence supports crown molding up to 7.5” nested, and base molding up to 6.75”. There are a total of 10 positive stops on the stainless steel miter detent plate to ensure greater cutting accuracy. The indelible quality of the DEWALT DWS779 make it a true classic, earning it your consideration for the best miter saw for the money. Compatible with DEWALT laser system. Includes built-in carry handle. 15 amp, 3,800 rpm motor delivers extended power and durability. Adjustable stainless steel miter detent plate with 11 positive stops Improves productivity and ensures cutting accuracy. Tall sliding fences support crown molding up to 6-5/8″ nested and base molding up to 6-1/2″ vertically against the fence while easily sliding out of the way for bevel cuts. Double bevel design allows saw to bevel left and right 0° – 48° with positive stops at 0°, 33.9°, 45°, and 48° both left and right allowing user to flip the saw not the material. 0-50° left and right miter capacity for greater versatility. Lightweight (44 lbs. ), head lock-down pin, and built-in carrying handle for increased portability. ✓ View or download the MANUAL for the DEWALT DW716. If you want a dual-bevel miter saw but can’t justify spending the extra cash on sliding functionality, then check out this amazing 12” model from DEWALT. The DW716 packs a hefty 15A motor under the hood, or in this case right next to the 12” miter saw blade. The motor is planted inside an industrial looking yellow and black housing, and is situated towards the read of the saw head so that you can get better visibility while making certain types of cuts. This motor drives the 12” blade via a sturdy and virtually noiseless belt drive, which is embedded inside the saw blade housing so that the overall thickness of the saw head does not increase by much. Again, these little design aspects make a huge difference in the end user experience as you can cut more freely thanks to the extra vision of the saw blade that you get because of the low profile motor and drive assembly. The sliding aluminum fence allows you to execute incredibly accurate cuts on even the tallest of boards, and supports up to 6-5/8” of nested crown molding as well as up to 6-1/2” of vertical crown molding. The baseboard has a horizontal capacity of 10”, meaning that it is perfect for cutting photo and portrait frame segments, as well as for crown molding and general framing operations (door, window, etc.). DEWALT quality means you won’t be disappointed. The back fence can be fully retracted into the frame, extending the crosscut capacity from 2×8 to 2×10 inches. Thanks to the double design, you only need to flip the saw head and not the material while executing a negative angle bevel cut. Bevel cut range lies between -48° and +48°, while the miter table can rotate anywhere between -50° to +50° for added versatility. There are positive stops on the miter detent plate, as well as the bevel plate. A total of 11 positive stops have been included for increasing the speed at which you make commonly utilized miter cuts, while the bevel plate has positive stops at 0°, 33.9°, 45°, and 48° for both the left as well as right sides. Even though this particular model costs less than the DWS779 which is a sliding dual bevel miter saw, it features the exact same 15 ampere, 3800 rpm motor. Couple this with the fact that this is a fixed (non-sliding) head miter saw, and you get a machine that is more accurate and stable while also costing less. Don’t get us wrong over here- the DEWALT DWS779 is an extremely accurate saw and DEWALT have used the best sliding rails and linear bearings to make sure that you never experience any significant trouble while making cuts on the extended saw head. However, sliding saw heads tend to be slightly more unstable when they are stretched out to the maximum length. Also, the fact that this model weighs just 44 pounds in comparison to the 56 pounds of the DWS779 makes this a great choice for anyone who doesn’t need the additional reach of a sliding saw. A carry handle is also included on the top for easy short range transportation. 45° Bevel Cut Capacity (dimensional lumber) 2×8 (2×10 with back fence) left and right. 45° Miter Cut Capacity (Max Height) 4×6 dimensional lumber. 45° Miter Cut Capacity (Max Width) 2×6 (2×8 with back fence) dimensional lumber. 90° Cross-Cut Capacity (dimensional lumber) 2×8 (2×10 with back fence). 90° Cross-Cut Capacity (Max Width) 2×8 (2×10 with back fence). If you loved the DWS779 but found its vertical cutting abilities a little underwhelming, then take a look at the DWS780. This is the big brother of the DWS779, and boasts some really impressive specifications. Just like the DWS779, this is a corded dual-bevel sliding compound miter saw. Like the DWS779, it features a 12” saw blade and 15A motor assembly, both of which are mounted on a clamp held stainless steel rail system that utilizes extra durable stainless steel linear bearings for maximum stability and consistency while executing miter cuts. It even weighs exactly as much as the DEWALT DWS779, at precisely 56 pounds. But the similarities stop right there, as the DWS780 begins to show exactly why it costs more than the DWS779. First of all, you get additional vertical sawing headroom. This is done by changing two things on the DWS779 — the motor position and drive system design, as well as the sliding fence. By mounting the motor at a greater height, DEWALT has created a saw that is capable of handling crown molding as tall as 7.5” (nested), and base molding of up to 6.75” (vertical). One of the most popular miter saws on the market. The motor is connected with the 12” saw blade via a highly efficient and low profile belt drive, which is virtually noiseless. Smooth power delivery is guaranteed by a highly advanced gearbox assembly that is integrated into the motor housing, and this is the exact same 15A, 3800rpm DEWALT motor that we have in the DWS779 as well as the DW716. The miter table can turn 60° to the right, as well as 50° to the left. This should take care of any miter cut requirement that you could possibly have, and the miter lock handle features a cam lock along with a detent-override for locking miter angles quickly and accurately. DEWALT understands that not all of its customers are 20-something youngsters with perfect eyesight, which is why it provides an oversized bevel scale that has large and clearly marked angle points for greater legibility. The stainless steel miter detent-plate has 10 positive stops for increased productivity and faster angle locking times. In case you were wondering if the sliding rail system has been upgraded, you are in for a treat. It uses the exact same mechanism as the DEWALT DWS779 (which is one of the best sliding rail systems we have seen on a miter saw), but the sliding distance has been increased. When you combine this extra reach with the specialized back fence that can retract to further increase table space, you end up with some really impressive numbers. With the DWS780 you can cut wooden pieces of up to 2×16 inches in dimensions (thickness by width) while doing 90° crosscuts, and can execute miter cuts at a maximum angle of +/- 45° on boards that measure 2×12 inches. Impressive cutting width, isn’t it? Even more impressive is the fact that DEWALT managed to keep the weight unchanged from the DWS779 even though this model cuts deeper and wider. 90° Cross-Cut Capacity (dimensional lumber) :2×14 (2×16 with back fence). 90° Cross-Cut Capacity (Max Width): 14″ (16″ w/ special setup). Tool Weight : 56 lbs. With an overwhelming amount of satisfied customers based on Amazon reviews it’s clear that the DEWALT DWS779 is an absolute winner, demanding your consideration for the best miter saw for the money. This saw will bring joy to your face because it’s really that good & a breeze to use. Utilizes 20V Max* battery pack (DCB204) which provides on average 183 cuts of 2×4 Pine or 275 cuts of 3-1/4 pine baseboard. Integrated cut line cross-cut positioning system provides adjustment-free cut line indication for better accuracy and visibility. Capacity to cup 3 5/8″ nested crown and 3 1/2″ base vertically. Compact, lightweight design (31.6 lbs.) allows for easy transport and storage. Cam lock miter handle delivers quick and accurate miter angles. Battery and charger included. Consider an extra set of batteries (DCB205-2) to work all day. ✓ View or download the MANUAL for the DEWALT DCS361M1. Since we have already covered three of the most feature-packed corded miter saws from DEWALT, why not take a look at one of their best cordless models? Since there are probably a lot of you who need a compact miter saw that you can carry with you to the jobsite in the back of your truck, or even the trunk of your car/van. The main issue that cordless models face is the lack of power and cutting space. They normally run off either an 18V, or a 24V lithium ion battery pack. An electric motor converts electrical energy into rotational power, but the amount of rotational power that it can generate is directly proportional to the amount of electrical energy that is applied through the coils of the motor. If you want a reliable miter saw but a DEWALT — it’s that simple. With a battery pack you can only provide so much electrical energy to the motor, hence most miter saws compensate for their lack of torque by using thinner and lighter saw blades (low kerf blades). While there are many cordless models out there which feature 12” blades, sliding rails, dual-bevel capability, etc. you are better off buying an 8” or 10” model if you wish to have true portability. A 7.25” cordless miter saw is even better, since its motor doesn’t need to consume as much power because of the smaller and lighter blade. This means that you need to carry less weight, and can achieve greater battery life. The best part is that you can even swap out one of the blades from a chop saw and throw it into the miter saw, since almost all chop saws use a 7.25” saw blade. Just make sure that the arbor size and shape is the same between the two saws. The cordless model that we are reviewing over here is the DEWALT DCS361M1, a cordless 7.25” sliding miter saw. Adding in the sliding capability will make sure that you are not as limited by cutting width as you would normally be on a saw of this scale. The slider system is based on the same stainless steel dual rail clamp-assisted system that DEWALT uses in their much larger and highly expensive 12” dual-bevel models. The DEWALT DCS361M1 is NOT a dual-bevel miter saw, so if you have a lot of framing and crown molding work to do, you might want to look somewhere else. The maximum cross-cut capacity is 8” with the slider fully extended, and the horizontal capacity with a flat-lying baseboard is 8” (the maximum length of wooden piece that is supported by the worktable on this saw). The maximum angle for a miter cut with a thickness of 2” is 45° for both right and left miter angles. Maximum miter cut width is 5.5”, at an angle of 45°. Vertical cutting capacity is also somewhat limited by both the size of this saws blade, as well as the motor mounting. Because of the direct drive design you get reduced vibrations while cutting, but sacrifice a little bit of vertical cutting capacity since the motor will tend to touch down on the wooden plank as you lower the saw handle too far. With the baseboard against the fence, you get a cutting height of 3.5”. Vertical capacity while crown molding (vertically nested) is 3-5/8”. The saw comes with a carbide-tipped blade pre-installed, as well as a blade wrench for easy replacement of the saw blade. Total weight with the 20V battery pack installed, is just 31.6 pounds. Highly portable & the capacity to cut 4×4 dimensional lumber in one pass. Powerful 13.0 AMP direct drive motor requires less maintenance and delivers 4,300 RPM. Miters 0° – 47° left and 0° – 60° right, with positive stops at 0°, 15°, 22.5°, 31.6°, 45° (left and right). Rear handle bevel lock is easily accessible and adjusts 0° – 45° (left and right) with positive stops at 0°, 45° (left and right). Less weight (43.7 lbs.) and compact design for job site portability. Ergonomic rubberized D-handle design for better fit and added comfort. Large precision machined aluminum base supports material for more efficient cutting. ✓ View or download the MANUAL or the PARTS LIST for the Makita LS1018. This Makita 10” dual-bevel sliding compound saw features one of the most unique handle designs that we have ever seen on a miter saw. Unlike most other saws that use a horizontally-aligned trigger handle, the Makita LS1018 uses a rubberized D-handle for extra comfort and greater control. There are actually two separate gripping points on this saw — one of those is the D-shaped handle which contains the actual trigger for switching on the motor. The second grip point is located further ahead and resembles a linear horizontally aligned grip. You can select the D-shaped grip for making bevel cuts, and the linear grip for executing crosscuts. This is something that we really appreciated, since bevel cuts require a different saw head alignment when compared to crosscuts. Despite this fact, manufacturers continue to provide the same old bicycle handle style grip on most of their low-mid range offerings, while reserving the adjustable handles for the premium end or flagship products. Smooth start-ups and consistent, constant power with no belts to slip or replace. A little handle change might not seem like much of an innovation, but it goes a long way to show how much Makita actually cares about the people who use this saw, since many of them might be middle-aged people who are suffering from wrist problems or have arthritic joints. Also, both of the handles on this Makita saw are coated with non-slip textured rubber that feels soft and has some really nice grip to it. Moving back to the actual saw itself, we have a 10” blade that has been designed to deliver fine, precision cuts. This blade is attached via direct drive to the powerful 13.0 Amp motor that can achieve a maximum speed of 4300 rpm on zero-load. This is significantly higher than what most manufacturers can achieve on their 10” offerings. We recommend this saw for ripping and cutting metal pipes because of the high rpm motor, although it is still excellent for executing precise crosscuts and picture-perfect miter or bevel cuts. Another built-in convenience feature is the soft start. This makes the motor start up slow, and it gradually gains rpm over the course of a couple seconds. Not only does this eliminate the annoying jerk that you feel while starting up a miter saw, but it also increases the belt life and greatly reduces belt-slip chances (less maintenance headaches, thank you Makita). The ultra-durable and highly stable precision milled aluminum base ensures cleaner cuts by vibrating less, and an electric brake has been included (blade goes from maximum speed to zero in a couple seconds) to reduce downtime every time you wish to reset the saw in order to execute consecutive cuts. The blade guard is see-through, while the trigger is oversized so that you can operate this comfortably irrespective of your hand size. There are extension wings to support extra-long work pieces, and a box wrench has been provided to aid with blade replacement. We definitely rate the Makita LS1018 among one of the most user-friendly miter saws out there, because of the uniquely shaped handles, oversized trigger, soft start, and electric blade brake. It cuts up to 12” at 90°, and 8.5” at 45°. Miter angles ranges between -47° to +60°. If you need portability and cordless power then this is for you. Makita-built motor delivers 2,200 RPM. Weight : 27.3 lbs. Portable and lightweight. Four steel rail sliding system is built tough and ensures accurate cuts. Large aluminum base supports large stock. Versatile. Positive miter stops at 9 settings: 0°, 15°, 22.5°, 30° and 45° left and right. Direct drive gearbox for increased cutting efficiency and less maintenance. Rubberized soft grip handle provides increased comfort on the job. Rapid Optimum Charger communicates with the battery’s built-in chip throughout the charging process to optimize battery life by actively controlling current, voltage and temperature. ✓ View or download the MANUAL or PARTS LIST for the Makita XSL01 LXT. The Makita XSL01 LXT is a direct competitor to the DEWALT DCS361M1, since both of them are cordless miter saws, and both are priced similarly in the market. If you take stability and precision into consideration, we have to give Makita the edge over here. You see, a sliding miter saw tends to be slightly more inaccurate when compared to an equivalently priced fixed head miter saw. This is because the sliding rails induce a little bit of play into the saw head as it cuts through the wood. Ideal for: Remodelers, flooring contractors, cabinet installers, case and base installers. The saw blade trembles ever so slightly when you try to extend the rails out to their maximum length, and this can potentially induce some jaggedness into the cut. However, if you throw in a 4-rail sliding system, the entire story changes. Here, the sliding system consists of two separate dual rail systems, one mounted on top of the other. Each dual rail system covers half of the maximum extended length, so you need to extend the top rail fully before you extend the bottom one. This essentially results in increased stability, and you get cleaner cuts. The Makita XSL01 LXT also weighs less than the DEWALT DCS361M1, at just 27.3 pounds versus the DEWALTs 31+ pounds. This is not a complete dual-bevel miter saw, but it does allow for a bevel angle of up to 5° for the right side, and supports a bevel angle of 45° to the left. This saw can miter 47° to the left, and 57° to the right. There are a total of 9 positive miter stops, and an electric brake has been included so that you can stop the saw blade much more reliably and quickly. This saw also features the same D-shaped rubberized handle as its larger, corded brothers. To power the 7.5” (7.5”, not 7.25”) blade, Makita has provided a 2200 rpm electric motor that is fed by an 18V lithium ion battery. This saw is great for crosscuts up to 11.75”, and can cut into wood as thick as 2-9/16” at a 90° angle. Maximum cutting capacity with a miter angle of 45° is 1” x 11-3/4” (thickness x width). Net Weight (with battery) : 27.3 lbs. — Dual Slide Compound with Laser / 53.3 lbs. INCLUDES : Blade, dust bag, vertical clamp, wrench and triangle. 10″ slide miter saw with the crown molding cutting capacity (6-5/8″ nested) of a 12″ miter saw. Exclusive 6 linear ball bearings engineered to deliver “dead-on” accurate cuts. Less weight (53.3 lbs.) and the most compact design in its class for easy jobsite portability. Powerful 15.0 AMP direct drive motor requires less maintenance and delivers 3,200 RPM. Largest crown molding cutting capacity in its class. Miters 0°-52° left and 0°-60° right, with positive stops at 0°, 15°, 22.5°, 31.6°, and 45° (left and right). ✓ View or download the MANUAL for the DEWALT LS1016L. If you felt that the DEWALT XSL01 LXT was great in terms of stability and precision, but lacked the “oomph” that is needed to cut through larger boards, poles, and planks, try the Makita LS1016L instead. It is a corded 10” dual-slide compound miter saw that provides a nice balance of power, precision, and consistency for maximum versatility. On top of that, it also uses the unique rubber coated D-shaped handle from the two Makita models that we had reviewed previously. This allows you to execute bevel cuts, as well as crosscuts with great ease and a high degree of comfort. Just like the previous two models, this one uses an electric brake in order to bring the saw blade to a complete standstill within a matter of 1-2 seconds. The dual sliding system is designed to provide greater stability while cutting, and it does so by using 4 stainless steel rails instead of 2. Even though the total weight of 53.3 pounds might seem a little too heavy at first, you need to consider that this is a full-fledged dual bevel 10” sliding miter saw we’re talking about. The saw head glides on 6 linear ball bearings to deliver smooth, consistent, and adjustment-free cuts. 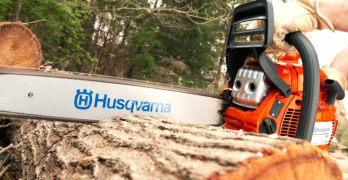 A laser guidance system further boosts the accuracy of your cuts, while the unique section system pulls more than 75% of the saw dust and chippings into the built-in saw dust bag. Net Weight : 53.3 lbs. Built for precision! Largest crosscutting and crown cutting capacity in its class. The Makita LS1216LX4 is a corded 12” dual slide compound miter saw that comes with a guidance laser and stand pre-attached. If you’re a novice woodworker then the laser blade guidance can come in really handy, since it will allow you to see exactly where the blade shall make the cut even before you fully lower it onto the wood. Patented 4-Steel Rail Sliding System. In terms of cutting capacity, it is about as good as you would expect from a 12” miter saw. The Makita LS1216LX4 supports crown molding (vertically nested) up to 8”, and allows for 6.5” vertical crosscuts against the fence. When the dual sliding system is fully extended, you can execute 15” crosscuts at 90-degrees. This is far more than what a simple dual-rail sliding system can achieve, hence you really should consider getting this saw if you plan on doing a lot of crosscutting for making wooden tabletops, bed panels, door panels, etc. The powerful 15A direct drive motor requires much less maintenance than conventional belt drive systems (because there are no broken/slipped belts to worry about, duh). If you tend to shift between worksite to worksite on a regular basis, or if you own a mobile workshop, then investing in a stand-mounted miter saw can be very useful. You can fold up the stand and load the saw into your vehicle whenever you need to get mobile, or you can unfold the stand table and use the built-in wheels to roll this 116 pound behemoth onto the jobsite when duty calls. Net Weight : 116.2 lbs. Intelligent battery system optimizes the flow of power. Automatic Speed Change™ technology adjusts cutting speed and torque during cut for optimum performance. Large aluminum base supports large stock for efficient cutting. Rapid Optimum Charger communicates with the battery’s built-in chip throughout the charging process to optimize battery life by actively controlling current, voltage and temperature (battery and charger sold separately). Rapid Optimum Charger has a built-in fan to cool the battery for faster, more efficient charging (battery and charger sold separately). Makita technology delivers category-leading charge time so the battery spends more time working and less time sitting on the charger (battery and charger sold separately). One thing has always bugged cordless miter saw users- the lack of sufficient cutting power. No matter how efficiently you design the motors, you simply cannot get over the fact that 18/20/24V lithium-ion battery packs are simply incapable of supplying the power that is needed to make a corded miter saw motor perform at the same level as a corded miter saw motor which gets it power from a 110V electrical outlet. Engineered for precision, durability and convenience thanks to battery power. Makita seems to have the answer to that issue in their brand new cordless 7.5” dual slide compound miter saw, the XSL02Z. So how did they remedy the power issue you ask? Well, that’s very simple. Just throw in two 18V Li-Ion battery packs instead of one! This gives a net voltage of 36V, which according to Makita is sufficient for pushing the miter saw to previously unimaginable levels of performance. But does it perform as well as a corded 7.5” miter saw? Actually, it performs BETTER than a corded miter saw of similar capacity. This is evident from the fact that the direct drive motor can attain speeds of up to 5700 rpm on zero-load. This is insane, considering the fact that max motor speeds for the rest of the competition languishes beneath 3000 rpm when it comes the cordless 7.5” miter saw market. Makita have also used their patented dual-sliding 4 rail system with which you are probably well acquainted by now. Simply put, Makita’s dual sliding solution is the best rail based sliding mechanism currently available on the market. Makita uses specially engineered brushless electric motors to reduce energy loss through friction and heat, and this change results in increased efficiency. 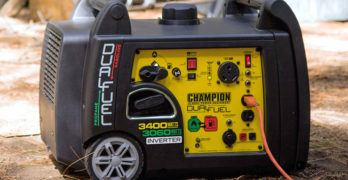 Power consumption for this new motor is reported to be up to 50% less than that of the competition, which means that the XSL02Z delivers vastly superior battery life. If the convenience of battery power is important to you then this is indeed one of the best miter saws for the money. Bosch-exclusive Axial-Glide — wider cross-cuts, accurate alignment & smooth gliding. 12” Dual-Bevel Glide miter saw that features a smooth cutting motion, accurate performance and a space-saving design of the Bosch-exclusive Axial-Glide system. Pre-aligned Squarelock fences help the saw maintain precision throughout its life. A soft-grip ambidextrous handle along with a combination dust chute and vacuum adapter. The saw also offers a large cutting capacity, easy-to-read bevel and miter scales with detents at common angles, and easy-access upfront controls. Integrated expanding base extensions: 60% more left-to-right material support than leading competitor – 40″ left to right. Adjustable miter detents at : 0°, 15°, 31.6°, 22.5°, 45°, 60° right. Push-button miter Detent override : Easy-to-access thumb actuated control right up front for fine miter angle adjustment. Bevel detents: 0, 33.9°, 45° left/right for accurate cuts. The Bosch GCM12SD delivers the smoothest and most consistent cut of all 12” non-fixed miter saws currently available on the market. It uses an arm rack suspension system for the saw blade and motor assembly, meaning that the overall stability as well as total reach is highly superior to that of a simple slider based system that depends on sliding rails for increasing the cross sectional reach of the saw blade. No load speeds of up to 3800rpm are possible with the powerful 15 Amp motor that is used in this Bosch saw, and the clear blade guard helps offer unobstructed cut-line visibility for easier and more accurate cutting at all angles (especially with 90° crosscuts). The motor is located above the actual saw blade itself, and drives the 12” circular blade via a belt assembly. Bosch calls their arm rack suspension system the “Axial Glide” system, and it is vastly superior to any rail based slider currently available on the market. Axial-Glide System is engineered to create smooth cuts & gives you full control. When you don’t need the extra reach, just push the saw head inwards and watch as the arms fold up to save space. When you need to do those 15” crosscuts, just pull the blade out and it will glide through the air like a balloon. All of this is possible while maintaining zero vibration or flexing in the arms or joints of the suspension. The ambidextrous handle on this Bosch is the second most comfortable rubberized miter saw handle we have ever used, the most comfortable one being of course the D-shaped handles on the Makita models. However, the dust recovery system on the Bosch GCM12SD miter saw is second to none. It uses a combination dust chute and vacuum adapter to remove up to 90% of saw dust from the table space. Bevel angle range is a stellar 48° for both left as well as right sides, while the miter angles are 52° for left and 60° for right respectively. Video | See it in Action! *Fits most competitors’ tools, and these Bosch miter saws: CM10GD, CM12SD, 5312, CM8S, CM12. Fast setup, strong frame and space saving design make this a smart purchase. Integrated out feed and supports — up to 18 Ft. of material support capacity. Adjustable telescoping leveling leg. Sturdy on uneven surfaces. Adjustable height out feed (up to 12″). Universal mounting system — Compatible with all major competitors’ saws. 8-Inch Pneumatic Wheels for efficient mobility over all types of terrain. Axial-Glide System provides wider cross-cuts, enhanced alignment and smoother glide. Category-best 90% dust collection – optimized for cutting 2x material with a vacuum. Ergonomic ambidextrous trigger handle with comfortable soft grip. ✓ View or download the MANUAL for the BOSCH CM10GD. Utilizing the exact same Axial Glide suspension system for the saw head as its more expensive counterpart, the Bosch CM10GD is one of the finest 10” dual bevel miter saws currently available. Like we have mentioned previously, Bosch’s arm rack suspension system, aka the Axial Glide system delivers a far superior cutting experience when compared to an ordinary sliding miter saw. You will also find that an arm rack suspension based saw occupies less space than a slider saw, even if the extended reach is similar on both. A 10” carbide-tipped 60 tooth saw blade is pre-attached to the Bosch CM10GD, and this is perfect for executing fine crosscuts as well as bevel and miter cuts at all angles in almost every type of wood (except for certain MDF boards, and veneer plies). The vacuum adapter port allows you to connect an industrial vacuum to the dust exhaust port in order to collect up to 90% of all the saw dust that is generated by this saw during operation. This is far better than the 70-75% saw dust collection claims made by competitors who use basic dust collection bags instead of vacuum ports. One of the redeeming features in this Bosch saw that makes operating this machine a truly enjoyable experience, is the location of the bevel lock lever and range selector. Instead of cramming these two extensively used controls behind the saw, a place where most of us hate to go while operating the saw with one hand, Bosch has put them on the front of the saw for easy visibility and convenient access. The raised motor mount allows for higher vertical cut clearance, and the completely transparent blade guard greatly improves cut line visibility while making 90° crosscuts. Comes with a , 60-tooth blade, wrench set, tool-free vertical work clamp, & dust bag. Up-front bevel lock lever and range selector knob — easily-accessed controls for quick and accurate bevel settings. Large 25-1/2 In. base with built-in cast sliding extensions for 40 In. total length. Tall 4-1/2 In. speed-track sliding fences — for easy bevel set-ups and increased crown molding cutting capacities. Easily readable bevel and miter scales — for easy setting of accurate bevel and miter angles. Exclusive wedge-and-slot miter Detent system — consistent and precise miter angles over the life of the tool. Miter Detent override — for fast and precise angle adjustment. Dual sliding rail design — for superior accuracy. Electric brake — for quick, repetitive cuts. stops blade in seconds. The Bosch 5312 is one of the cheaper and older Bosch miter saws that you can currently buy. It lacks their fancy Axial Glide suspension system, and uses a simple dual rail sliding mechanism instead. But is this miter saw worth your money when companies like DEWALT and Makita offer very similarly priced alternatives? After all, this is just another dual-bevel sliding compound miter saw. Well first of all, DEWALT and Makita don’t include premium thin kerf 60-tooth carbide tipped blades with their saws. What advantage does this blade have over a standard blade you ask? Well, since it is a thin kerf blade, you can execute much cleaner crosscuts and better bevel cuts with this blade. It will also generate less heat and waste, meaning that the already super-efficient dust collection system on this Bose miter saw has to do even less work when you use the pre-installed blade. The dual-rail sliding system might not be the steadiest of them all, but it is still extremely reliable as well as easy to maintain if something breaks down (good luck replacing those arms if the fancy Axial Glide system malfunctions or breaks). Spare parts are available much more easily for a system that has been around for several years, such as the dual rail sliding system which we can find on most DEWALT, Makita, and certain Bosch saws such as this one. Okay, so it easier to maintain and delivers a cleaner cut thanks to the super thin kerf premium carbide tipped blade. But does this Bosch saw deliver anything else? 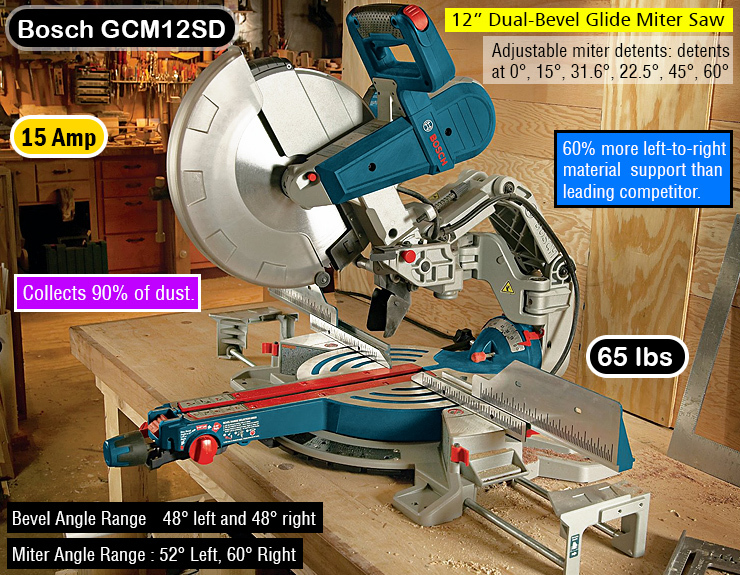 Well, it features one of the largest working bases that we have ever seen on any 12” compound miter saw- nearly 25.5”. The built-in extensions will take this length to 40” when they are fully extended. This is perfect for edging and sizing fences, poles, pipes, etc. An electric brake has been provided for executing quick, repetitive cuts. Miter angle range features 52° on the left & 60° on the right. An entry level miter saw. Don’t expect pro quality and you won’t be disappointed. Large extended flip fence, raises to 4″ for cutting crown molding vertically. Only 26.3 lbs to facilitate maneuverability and portability. ✓ View or download the MANUAL or the PARTS LIST for the C10FCE2. Even though the Hitachi C10FCE2 is actually a 10” compound miter saw, it features a rather powerful 15 Amp motor for making really deep cuts in even the hardest of woods, as well as some ferrous metals. The low price of this Hitachi miter saw is not reflected in the specs sheet, since it appears to feature a miter angle range of -52° to +52°, and even has a 0-48 degree bevel range (only to the left, no dual bevel). Video | Watch this Real User Review! Honestly, for this price we were not even expecting to get bevel functionality. The blade guard seems rather weirdly designed, and is neither transparent nor opaque. It does not have a clear color scheme either, and honestly is just plain distracting. Visibility is impeded while executing cross cuts because of this shabby blade guard design, as well as the low mounted motor that apparently connects to the saw blade via a direct drive system. While the direct drive system adds in some extra stability and reduces maintenance worries, the saw blade itself (a 10” TCT blade) is not the best. You will need to buy a decent one if you plan on cutting a lot of material on a daily basis. Otherwise, the pre-installed saw blade should suffice for occasional edge trimming and basic framing work. One of the biggest advantages to owning this 10” single bevel saw is the ultra-light weight of just 26.3 pounds. An exceptional value that can’t be beat. It’s a bargain! It also seems to be compatible with the UU610 miter saw stand from Hitachi, so grab one of these along with the specified Hitachi saw stand if you’re looking for a cheap yet highly mobile 10” single bevel miter saw station. Ultra-lightweight makes it easy to move around. Works with virtually all miter saw stands. Spindle lock holds spindle securely while blade nut is loosened and removed. Capacity – Cuts nominal 4X4 and 2X6 at 90° and 2X6 at bevel setting, with one pass. Bevels Left – From 0° – 47°, cuts nominal 2×6 at full bevel. Mitering Capabilities – Miters to 45° degrees left and right with stops at 0°, 15°, 22.5°, 30° and 45°. Laser – Battery Operated with on/off switch. Makes aligning blade to workpiece more convenient and precise. ✓ View or download the MANUAL or PARTS LIST for the Homecraft H26260L miter saw. Homecraft is actually a brand of Delta Tools, and is dedicated to manufacturing affordable low-medium end products for the basic household consumer. One of those ultra-affordable products happens to be the Homecraft H26260L miter saw. This is a single-bevel 10” corded miter saw, and features a super basic yet highly compact and lightweight design. It can bevel to the left only, and has a maximum bevel range of 47°. Miter cut capacity is 4×4 and 2×6 at 90° (crosscuts), and bevel cut capacity is 2×6 (thickness by width). Miter angles are not the best as this saw can only miter 45° to either side. Well, at least it has positive stops at 0, 15, 22.5, 30, and 45 degrees so that you can somewhat speed up your workflow if you plan on making repetitive cuts at any of these commonly used angles. The dust removal system seems to be fairly basic, and the collection port is not compatible with an industrial vacuum attachment. Instead, all of the dust and fillings (the ones that the suction port catches anyways…) are routed to a collection bag on the back. Even though the motor is mounted fairly low and somewhat impedes visibility while make crosscuts, the blade guard is completely transparent which slightly improves cut-line view. To our surprise, this Homecraft saw actually includes a laser blade-guidance system that is battery powered. Talk about value for your money! Work table includes two support arms, a fence and a hold down clamp. 15 amp motor supplies 5500 RPM. Bevel anywhere from 0 to 45 degrees to the left and miter up to 52 degrees in both directions. Includes 60-tooth carbide tipped blade, dust collection bag, support arms, fence and hold down clamp. Spacious worktable and powerful saw provide a max cutting capacity 3.25 inches thick and 11.5 inches deep. ✓ View or download the MANUAL for the WEN 70716. WEN makes some really incredible power tools, although they are much more famous for manufacturing chainsaws, mowers, and snow throwers. However it seems that their miter saws are not too shabby at all, even though these guys have only been making miter saws since the last few years. Well, if you needed a sub-100 dollar sliding compound miter saw from a reputable power tool manufacturer then check out the WEN model 70716. It packs some features which are normally found only on high end miter saws, such as the laser guidance system, and an ergonomic handle. This is a single-bevel 10” compound sliding miter saw (yes, you do get a sliding saw for this cheap!) and is compatible with nearly every miter saw stand out there. The motor in this saw is rather powerful, and can spin at 5500rpm with zero-load. You can take advantage of the 10” blade size to crosscut wider planks and boards, meaning that this is a great saw for cutting door panels, framing, cabinet boards, etc. With the medium sized 10” saw blade and extra-powerful 15A motor, you can tackle boards up to 3.25” in thickness, something that a few premium 12” saws cannot do even if they cost more than twice as much. You can bevel up to 45° to the left, and can miter up to 52° in both directions. Thankfully, WEN included a 60-tooth carbide tipped blade in this saw. This blade is excellent for all types of cutting across a wide variety of materials. By extending the sliding rails, you can handle crosscuts in boards up to 11.5” in width. The entire saw weighs just 30 pounds, and is backed by a stellar 2-year limited warranty. Well, I hope after all of this you are able to decide on the Best Chainsaw for the Money! We have put a lot of effort into writing this miter saw buying guide in the hope that it will help you spend your hard earned money on a saw that will last you for years to come. There’s something here for everyone and then some. Wear safety glasses or a face shield whenever you operate a miter saw, and keep your hands at least 6 inches away from the blade. If you’re cutting soft wood or particle board, use a dust mask because these materials tend to emit a lot of saw dust and micro fillings. Attach the saw firmly to a workbench or table, and make sure that it is mounted at waist height (i.e. the base of the saw is at waist height). Unplug or lockout power to the miter saw whenever you attempt to replace a blade or carry out some maintenance task. Clean the lower guard after each work session to maintain proper visibility of the blade at all times. Use only recommended blade sizes in order to prevent damage to the saw motor and arbor. Before switching on the saw, make sure to check the blade attachment. If the blade is not properly secured or feels wobbly, do not turn on the saw as the entire blade could fly out and deal lethal damage. Ensure that the blade as well as its related fasteners and washers are properly fixed and secured on the saw arbor. Do not reach for the cutting area until the blade has come to a full stop. If you’re using a sliding miter saw, always start the cut with the blade closest to you and gradually move it away by plunging downwards and pushing the blade along its sliders. Don’t wear loose clothing (scarfs, shawls, etc. ), jewelry, or any dangling objects while operating the miter saw. Never operate the saw on a wet floor. Do not perform freehand operations, and avoid cutting small pieces of wood with a miter saw. Keep the saw blade clean and debris free whenever you can. Clean the blade with a blade brush, and wipe off the dust with a dry dust rag. The miter, bevel, and safety guard need to be oiled occasionally in order to ensure smooth and consistent functioning. Regularly check your miter saw for signs of damage and/or wear and tear. Check the saws power cord regularly for any signs of broken insulation.